Overview: This course and related material will bring confidence and a working understanding of the die cast process. 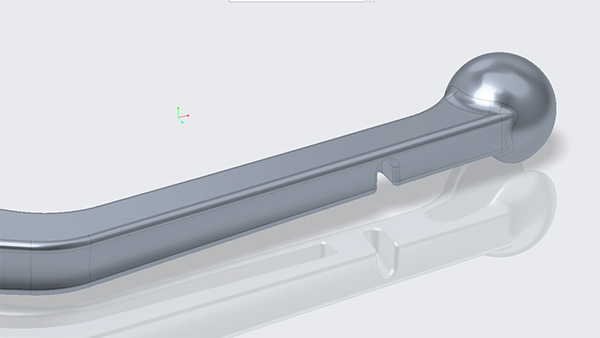 The bulk of the time in this workshop will be spent on the part design requirements imposed on the designer by the die casting process with respect to your CAD design tool of choice specifically Creo or Solidworks. Note: Mention to your Design-Engine account manager that you have in house Buyers interested in this course so the CAD tool can be administered on the second day excluding those individuals on the second day. Similar Courses: Manufacturing Week long Intensive, Plastics Part Design, Forging Part Design, Mold Design class, Learn Creo Sheet Metal Training. Compare metal injection molding to powder injection molding to PIM to die casting. Die casting vs plastic molding. Die casting vs permanent mold. Die casting vs forging process with respect to cost and quantity. Prerequisites: General knowledge of Creo or another parametric 3-dimensional CAD modeler helpful but not necessary. The process, die cast molds, tooling, processing factors, nominal walls, radii & draft angles, ribs, weld lines, stress, cooling metals, bosses, undercuts. Also Snap Fit, FEA, design recommendations, overview of flow mold analysis software. Learn to design molded undercuts and sliders. Learn about various die cast materials and alloys and discuss material properties such as adding zinc and copper for more malleable alloys i.e. Kohler faucets. Engineers or designers will learn to utilize tooling and die cast molders as a resource to design better piece parts. Learn about the metal mold itself and many of its intricacies such as sleeve ejection, how it is cooled, sprue and runner, ejector bars, ejector plates, and ejector pins. Discuss the steps for die the casting process. Learn about techniques for pore-free casting process for eliminating gas porosity. Learn about heated-manifold direct-injection die casting. Die casting as a process and its specific history. Discuss how a die cast mold process works in detail hot chamber vs cold chamber. Learn about Alloys with respect to die casting… zinc, aluminum, magnesium, copper, lead, and tin. Also factors in choosing the proper alloy. Discuss how China plays a major role in die cast tooling and the casting process. Discuss the quotation process for tooling and discuss partnering with local die casters molders vs outsourcing. Strengths and weakness of outsourcing. Discuss basic design elements in die cast part design. Holes, ribs, thin wall features, bosses, nominal walls, and fill. General rules for hollow boss design and discuss best practices. Learn about thin blade situations and discuss ways to avoid. Advantages and disadvantages of die casting compared to Plastic injection. Discuss gating and discuss problems such as fill vent and eject issues as related to die casting. Also discuss how to design in solutions to would be cosmetic problems. Discuss cooling time as related to thick sections of aluminum. Discuss internal voids and fundamentals of other problems that occur from improper piece part design. Discuss using parametric modelers in general and discuss examples where using variables with a parametric modeler can save problems in the future complete with in class examples. FEA and stress associated with die cast design with respect to FEA. Keeping in mind the deliverable for FEA is simply to make design recommendations discuss the possible solutions to many of the common molding problems. Keep in mind shrink, stress from sharp corners as related to cavity filling. List die cast vendors and discuss their role and how designers can leverage their experience. Learn about tooling and different materials for mold design. Discuss from a machining point of view and compare to cutting graphite for electrode burning of steel. Discuss how to improve flow of the melt through the mold and learn about Flow Molding analysis software. Discuss designing undercuts and discuss advantages and disadvantages as relative to costs. Discuss testing die cast parts to failure and learn to design in specific design fail elements so inevitable fail is not catastrophic. Discuss general disclaimers on drawings such as “brake all sharp corners” and other associated notes that engineers might find on detail drawings. Discuss different types of undercuts and side pull options. Discuss what challenges a mold designer faces when designing a mold with respect to cooling. Draft as related to texture kits. Discuss how to call out textures in drawing programs with examples. Learn about the texture application process and why die cast parts often recess the texture. Learn about heat treatment and anodizing processes. Discuss chrome applications and other plating, painting, or powder coating processes. Learn about the of benefits of joining the North American Die Casting Association. If a part can fail lets design into the Creo Die cast Motorcycle brake lever a place to fail so as not to be catastrophic. Discuss Draft in its many forms complete with examples of split Draft etc. Learn to use surfacing and discuss its usefulness with die cast part design. 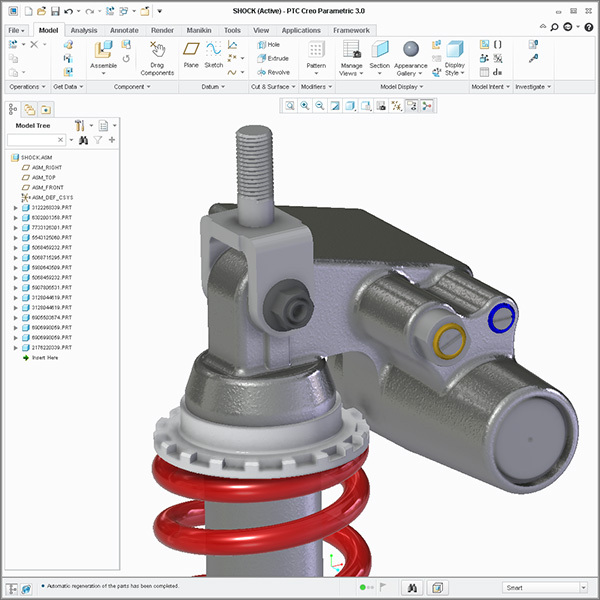 Learn to use top down design with examples in Creo or Solidworks. Add Draft to parts that currently have no Draft. On at least one example, use Creo to modify parts that others modeled so that those parts are moldable. 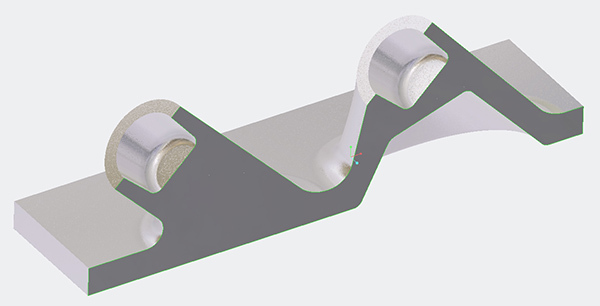 Discuss tips tricks and techniques for starting and completing die cast parts using Solidworks or PTC Creo. Learn to use parameters to drive geometry relative to nominal wall thickness. Discuss B-Side geometry creation techniques including secondary operations. Discuss bosses and ribs with respect to mold-ability, 70% rule, Solidworks equations or Creo relations & keeping the parts steel safe. Learn to use Utilize Draft check correctly. Techniques for managing prototypes so that they can be tested as if those parts were production die cast parts. Creo die cast housing showing a shut off for obtaining a straight pull from the mold. 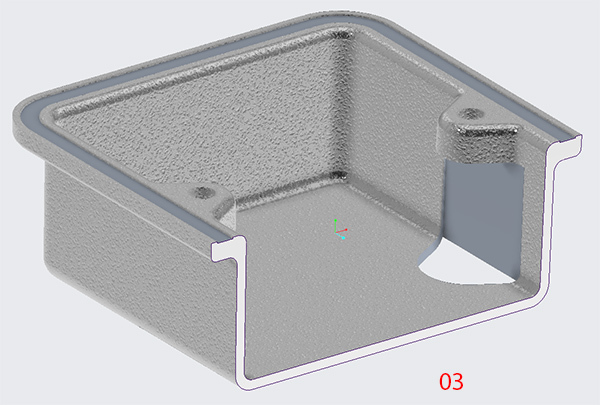 Introduction to die cast Part Design using a constraint based modeling utility such as SolidWorks or Creo. This course also covers tips and tricks for making changes easily. This training course is developed for new and seasons users who want to become experts in die cast part design in just two days. We help you learn not read to you from an exercise or a book. In this course we help design engineers learn how to make changes quickly to set them up for becoming expert faster. As with all Design-Engine classes, participants keep the training material login and password for life. There is a great deal of HTML course material students take back with them from this workshop.